I've never relied on a mold company salesman or rep to try to explain what is the best choices for my company or my customer. I find that 95% of the time the mold salesman is just that, a salesman with little or no practical knowledge of the molding process or industry and certainly not the best source of information that works best for my plant or my customers' plant. There are a lot of companies that rely on the mold maker to decide what to quote and how to quote it. Including what materials, components to use and design criteria. If one goes this route and allows each supplier to quote the job as they see it, you'll end with a wide range of prices, and probably quire different molds from each. Now you need to compare apples and oranges and sense out of it. 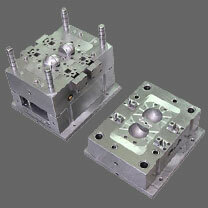 The mold supplier should be provided a set of mold standards that you expect all molds to be built to. This covers basic construction techniques, approved standard component suppliers, machine specifications, water connections, hydraulic connections, electrical connections, safety features, ejection features, etc. They should each also be provided with a fully detailed specification of the mold that you want including all materials, ejection details and injection details. This should be in as much detail as required so that there is no confusion on what you want. This way you are relatively assured that each mold supplier is quoting the same thing and you have a good chance of comparing apples to apples when you receive the quotes. Otherwise you will get what the supplier wants to build, which will be the easiest for him and most probably not be what you want or the best for you.